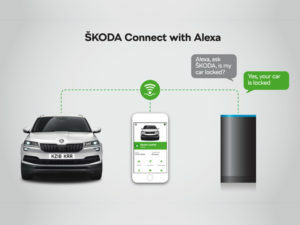 The Škoda Connect app is now integrated with Amazon’s Alexa virtual personal assistant, meaning owners can gain access to a range of information about their vehicle’s status and condition while hands-free. Available for the Octavia, Karoq, Superb and Kodiaq ranges, Škoda’s Connect app provides three core services – Infotainment Online, Emergency Call and Care Connect – with the latter offering drivers remote access to their car whenever they are away from it. The integration with Alexa means drivers can now access information about their car with their voice as well as via the app, covering 12 different parameters at launch, ranging from current fuel level to the average speed of the last journey. Drivers can also check to see if they have inadvertently left their lights on and even ask Alexa to remind them where they have parked. Further functionality is due to launch in the future.